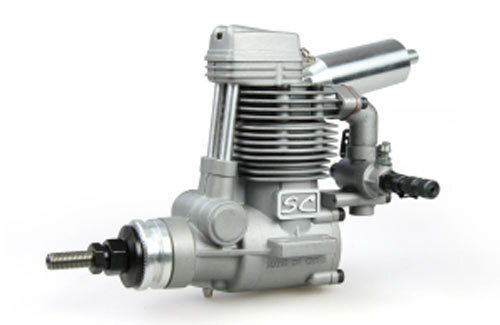 All Products > "4480530 SC Engines SC52FS Aero R/C Ring Engine (MKII)"
Ballraced precision new improved Mkll series engines add up to more engine and more performance for your money. SC have chosen to feature precision ABC piston/liner assemblies in 99% of their 2-stroke engines (the new 180 2-stroke is ringed). SC 4 strokes are primarily ringed for the easier handling characteristics this gives 4-strokes. Additionally, every single engine is turned out with a twin ball bearing crankshaft so that each engine will continue to run smoothly throughout its life - the same as it did on day one. Quiet swivel outlet silencers are standard with all except heli and marine engines.